The process in which dental caries (cavities) form is tooth decay. Tooth decay occurs when acids found within the mouth eat away at the surfaces of the teeth. Over time, this process results in the formation of a cavity. For our patients in Albuquerque, inlays and onlays may be used in the treatment of tooth decay. Inlays and onlays are typically used in the treatment of rear teeth that have been damaged by decay. Inlays and onlays may be used when rear teeth are too damaged for a traditional filling, but are not damaged enough to require a dental crown. An added benefit of inlays and onlays is that they are made of a tooth-colored material. Because of this, once placed, they become virtually undetectable. This tooth-colored material allows inlays and onlays to blend in seamlessly with the surrounding natural tooth matter. Through the placement of inlays and onlays, we can effectively restore the health and function of the teeth of our Albuquerque cosmetic dentistry patients in an aesthetically pleasing way. Usually made out of resin materials or porcelain, inlays and onlays are tooth-colored dental restorations used to treat rear teeth that have mild to moderate decay. Inlays and onlays are a good choice when the remaining structure of the damaged tooth is in good condition. They may also be used to prevent the loss of a damaged tooth due to decay and to reduce tooth sensitivity. Inlays and onlays may be used to repair chips and cracks in teeth and to replace amalgam (metal) fillings. Inlays and onlays are incredibly strong and long-lasting dental restorations. When cared for properly, inlays and onlays can last for many years. For damage and decay that lie within the indented top surfaces of the teeth, or the cusps, inlays are used. For damage or decay that extends to one or more of the cusps of the teeth, onlays are used. For patients who are unhappy with the appearance of their smiles, but are not suffering from tooth decay, porcelain veneers may be a more suitable treatment option. For our patients in Albuquerque, porcelain veneers can be used to improve the appearance of chipped teeth, discolored teeth, misshapen teeth, crooked teeth, and teeth separated by gaps. 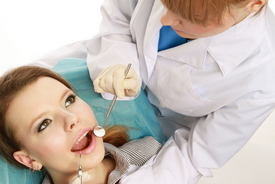 During your inlays and onlays treatment, cosmetic dentist Bryon W. Wall will prep the tooth. This involves cleaning out the damaged area of the tooth and then making an impression of the decayed tooth. Traditionally, the impression would be sent off to an outside laboratory where a dental technician would then make an inlay or onlay to your tooth’s specifications. At Cosmetic Dentistry of New Mexico, we are able to fabricate your inlay or onlay in our dental office. This allows us to custom-design, manufacture, and place an inlay or onlay during a single dental visit. If you are interested in learning more about inlays and onlays, porcelain veneers, or any other cosmetic or restorative dentistry treatment, please contact Cosmetic Dentistry of New Mexico today. We would be happy to answer any questions you may have.